Vibrations Tackle is an American Family owned business that is excited to bring a new product to the fishing market called the Echotail® The Echotail® was designed to be the most versatile blade bait that could be utilized in multiple fishing applications. Multiple towing holes allow for different vibrations and speeds. Easily interchange other plastics on the market by simply pushing them onto the back of barbed metal tail. 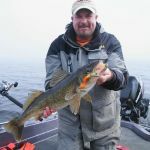 Cast & retrieve the Echotail® over weedbeds, snap jig over deep structure and river systems, jig them through the ice or troll them for walleye, musky, salmon, trout, pike, whitebass, and crappies. From panfish to gamefish, the Echotail® will accommodate all you're fishing needs. The new Echotail® Ice Series is rigged with a new plastic on the market manufactured by the Jr's Jig Tails company. We are offering the new Ice Series in both the Mini (1/10 oz) & Jr (1/4 oz) Echotail® models. The anise scented plastic is specifically designed to entice fish with its tapered tail. Combining the vibration from the Echotail® blade and the action from the plastic makes a deadly combination when targeting fish vertically through the ice as well as open water. The newly released Regular (1 oz) Echotail® is the a great lure for targeting many species of fish under many types of conditions. The Regular Echotail® is an ideal lure to utilize as a lipless crankbait for spring bass, jigging strong rivers for walleye, snap jigging salmon or targeting deep lake trout. 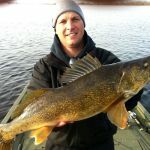 In 2013, the Regular was responsible for hooking the largest walleye caught on an Echotail®. 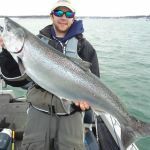 The fish measured 29 inches and was caught by Captain Steve Paulsen while trolling on Green Bay. The fish was caught on film too! 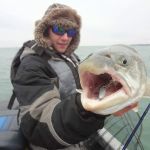 The Giant Echotail® is great for vertical jigging muskies and other large gamefish. The Giant also trolls to 20 feet! It offers a large profile and throws a ton of water. 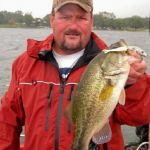 Use soft up & down jigging strokes mixed with a power rip (a forceful up and down jigging motion) every 12-15 pulls. 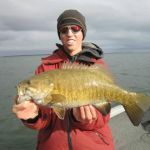 Using softer rips with the occasional power rip allows for continuous jigging with out creating strain on the arms. 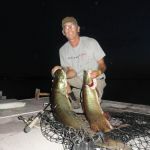 The occasional power rip will create a violent vibration, attracting fish in from long distances. Also, be sure to watch your electronics closely. When big fish appear on the graph, it's the perfect time to power rip, triggering a violent attack upon the Echotail®. Hold on tight! Custom Colors Be on the look out for a variety custom color Echotails created by some of the most talented painters in the industry including Tommy Harris. Also look for the new image technology the we have named the Aquatic Series. The Aquatic Series includes actual images of real fish!